Connect your non-networked device to any major fieldbus or industrial Ethernet networks with the Anybus Communicator. The Communicator performs an intelligent conversion between the serial protocol of the automation device and the chosen industrial network. For industral devices with a serial Modbus-RTU interface, HMS takes away the hassle of scripting and serial frame building by using visual template wizards contained within the included "Anybus Configuration Manager". This enables you to get your devices connected fast. The Communicator handles the complete serial protocol without the need for extensive PLC function blocks. This compact gateway consumes very little space in a switching cabinet and is easily mounted on a standard DIN-rail. For devices with a Modbus-RTU interface, the Communicator functions as a Modbus-RTU Master. 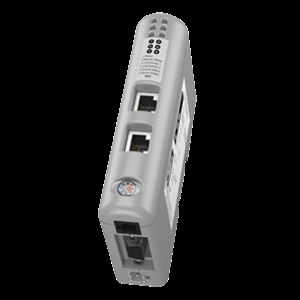 With its selectable RS-232/422/485 It is possible connect multiple devices using one Communicator. Therefore making for a very cost effective network connection for your devices. Compatible with all leading PLC's from manufacturers such as, Siemens, Allen Bradley, Schneider etc..